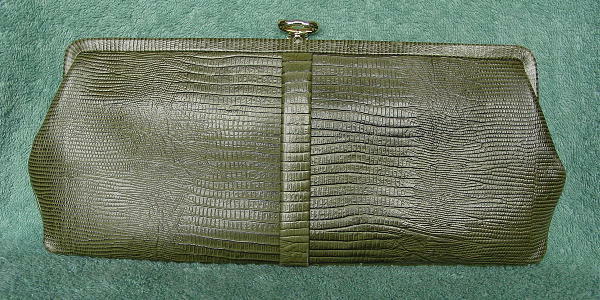 This vintage clutch has an olive green background and black accent reptile pattern. It's made of manmade materials and has a gold-tone freeform oval center closure. 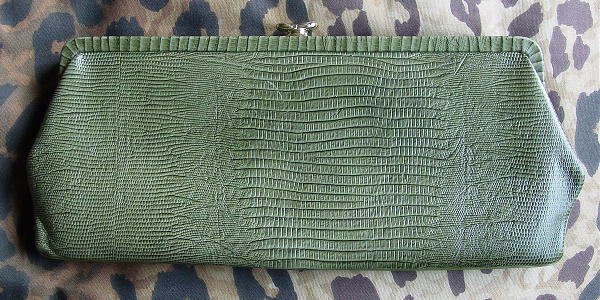 It has a black fabric lining, an interior zipper section, and behind that an open pocket. The reptile finish is worn off on one of the lower corners, and there's a slight scrape on the front side of the top rim. There are two diagonal scratches on the back. There is an accent center separate vertical strip. The top picture shows the color accurately.